You woke up late this morning and ran out the door without packing a lunch. Fast forward to 11:45 a.m. and you are starving. Time for fast food, right? Right, but not what you may be thinking. No I’m not suggesting a big ol’ bacon cheeseburger and onion rings (damn that sounds good) or a bucket of fried chicken. Rather I suggest that you find somewhere where you can get food fast, but you are going to have to get out of the car once you get there. 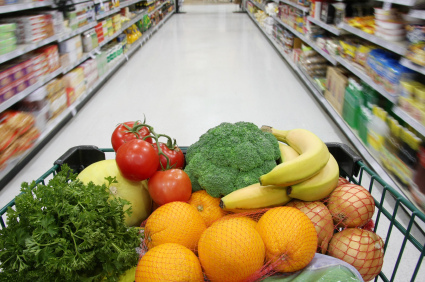 Most people have a grocery store or a market relatively nearby. A grocery store has all kinds of healthy choices that you can grab for a quick lunch that won’t wreck your healthy eating goals. Where else can you find such a wide array of fruits and vegetables? Sure, a few popular fast food chains now sell little bags of sliced apples (usually with a caramel dipping sauce) but fruits and vegetables are grossly underrepresented on most menus. Grocery stores have plenty of sugary, fatty “food” as well, but you stand a much better chance of making a healthy lunch decision. It helps if you already have a bowl or container of some sort and utensils in your office drawer or car, but if not the store should have some plastic options. You can pick up some lettuce, perhaps a head of Romaine or a bag of mixed greens; some fruit, strawberries or some crisp apples work well; nuts, walnuts are a favorite; some protein, you can usually find some precooked chicken or perhaps some nitrate-free lunch meat; and dressing, either in a bottle or get some oil and vinegar and mix up a simple vinaigrette yourself. There are hundreds of possible combinations, most of them much healthier than that pizza you were considering. And your choices are not limited to salad, take a walk down most of the outside aisles and you are bound to find a winner. Just stay out of the middle aisles which usually have the aforementioned sugary, fatty food-like substances.